Still Raunchy: Raunch Records reignites in Sugar House. 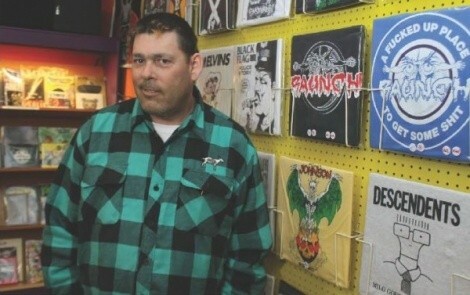 Brad Collins started Raunch Records in his apartment in 1983. It eventually became a full-fledged record store during the era depicted in the 1998 movie SLC Punk! Collins also had an influential radio show old-school KRCL fans still speak of fondly: Behind the Zion Curtain. Raunch eventually closed in 1997, and many thought Collins had “abandoned the scene,” as he puts it. But Raunch was just taking a break: 12 years later, Collins is back behind the shop counter, welcoming an eclectic and varied clientele in his new Sugar House store. Raunch (1119 E. 2100 South) is one of the few local neighborhood stores with a heartbeat after part of the 1100 East block was demolished, giving the area something to be excited about again. It’s time to check in with Collins and see how things are going. City Weekly: What have you been doing the past 12 years? Brad Collins: The only good thing about those years is that I met Dorothy, my significant other. That was the best thing that happened to me the whole time; she’s really cool. And this place wouldn’t exist if she hadn’t pushed me to make the shirts. CW: What has changed in the scene, and what trends have surprised you since you’ve been gone? BC: Cassettes. I see people making cassettes now. Maybe that’s the way for them to stay in a real underground situation where only the people that really like those bands have cassette players or they all have really old cars—I don’t know which one it is. [Provo’s] Tijuana Bible is a good example. They put out a cassette-only release, 100 copies; it turns it into an instant collectible thing because it’s all printed and nice. There are things I can’t get on CD or LP any more, but are on cassette. Cassettes have a different sound than records and they have a different sound than [compact] disc, too. The sound is really open on cassette. CW: What else are you selling that other shops may not? BC: We’re doing stickers and patches. We’ve got magazines and books that aren’t at most places. Probably Tony Weller has most of the stuff we have here, but we have some stuff that Barnes & Noble doesn’t. Between us and [Sam] Weller’s you can probably get your underground fix here again. CW: What are your current sales numbers like, music wise? BC: 90 percent vinyl, 10 percent CD. CW: And who usually shops here at Raunch? BC: Mostly old-timers … we haven’t seen the 20-year-olds and under yet, and we may never … I don’t even know if those kids really know how to shop. The Internet is so pervasive they may not know what a shopping experience is. And maybe there’s not enough destinations—maybe us being here is kind of like the loop we’ve been looking for—to have a loop of stores and go from one end of the valley to another and have this weird underground shopping experience that we used to have. CW: What do you have to say to future shoppers? BC: Nothing. They have to be into being here. It seems to be how this store is. It’s an acquired taste, and frankly, I don’t want to try and force-feed anybody. It’s good to just hang out and let people come in. And when they’re old enough to get into it, that’s great. And if they think Black Flag is the killer band, then that’s cool, because Black Flag is 35 years old. CW: How has it been lately, overall? BC: It’s been fun overall. I’ve had a good time doing the store and it’s good to see everybody again. If all we’re doing this for is to get everybody their shirt for the last time, then that’s cool, too. We’re not looking for a lot—we’re just looking to keep the place open.